SPORTS CARS: Bonnie and I enjoy taking extended road trips. I owned a 1969 Porsche (shown above) since 1985 and restored the Porsche 912 from 1985 to 1998. The non-stock parts on the 912 in the picture above were the 911 Porsche alloy rims (dealer-option for 911's, 1973-6 vintage), the Dellorto carbs (the Solexes needed refurbishing, but I still kept them), a 1750cc "big bore kit", racing-style side mirrors, and the GM Corvette "True Yellow" Imeron urethane paint job (sometimes referred to as "canary yellow".) We drove this 912 coupe to the 50th Porsche Anniversay celebration at the Leguna Seca Historics Race in 1998. Porsche was the featured marquee car for the 1998 races. In the Sunday parade, consisting of the first 200 Porsche cars to enter the track gate, we drove our Porsche two laps around the Leguna Seca track during the special event. We raced twice down the famous "corkscrew" turns and took videos of the parade laps! This car also represented the 1969 912 coupe model in the owners' lineup of all Porsche models from 1950 to 1998 displayed on the trackside tarmac. For the 50th Anniversary tour across America, the Porsche factory brought all of their collection of cars over from their car museum in Germany. The factory displays of Porsche prototype and race cars from the museum were fabulous. The only Porsche model year not represented in the Marquee lineup of owners' cars was a 1949 car (I believe 1949 was the first year a Porsche coupe was imported into the United States.) Longshoreman workers dropped the crate with Porsche #001 in it while unloading the transport ship on the east coast, so it was not on display at Leguna Seca. The Porsche family hosted a very special "birthday" party at the Mission in Carmel for the 50th Anniversary celebration. They gathered seven of the most famous living Porsche factory racing team drivers from years past to visit with Porsche owners at the dinner party. We sat right next to the courtyard fountain near the factory drivers and obtained all of their autographs on two Daytona GT2 car racing photographs and some other racing memorabilia that we brought with us to the party. It was a "once-in-a-lifetime" road trip and historics racing event experience that we will always remember and cherish! Click on this awesome hot link below to experience what it's like (from a race car driver's view, and don't forget to turn up the sound!) to run a lap around the 2.3-mile Leguna Seca race track in a vintage, 1968 McLaren M6 race car: www.youtube.com/watch. The only thing missing from this video treat is the smell of race fuel fumes in the morning air, the transitional side-force G's on your five point strapped-in body going through the "Cork Screw" turns, and the powerful race engine's vibration pulsing through the steering wheel and a pro racing seat! Thank you driver Gary Sheehan and Sheehan Motor Racing for posting your driving video on YouTube for us to enjoy. I sold the Porsche 912 coupe in late November, 2013, after over 28 years of ownership. The car was transported from Kelso to its new home in California on February 21, 2014. She will be missed, but not forgotten. We own a 1999 black-on-black Miata roadster that Bonnie named "Inky". Since this picture was taken, we have replaced the top on the Miata and added an OEM, special edition front bumper with driving lights. This little sports car is very well-balanced and really fun to drive through the "twisties" on back roads. It is a "true" sports cars with a tight suspension, flat cornering, good acceleration, and very positive steering characteristics. The Miata is a true sports car with excellent acceleration, reasonable gas consumption (30+ mpg average), and precise steering. 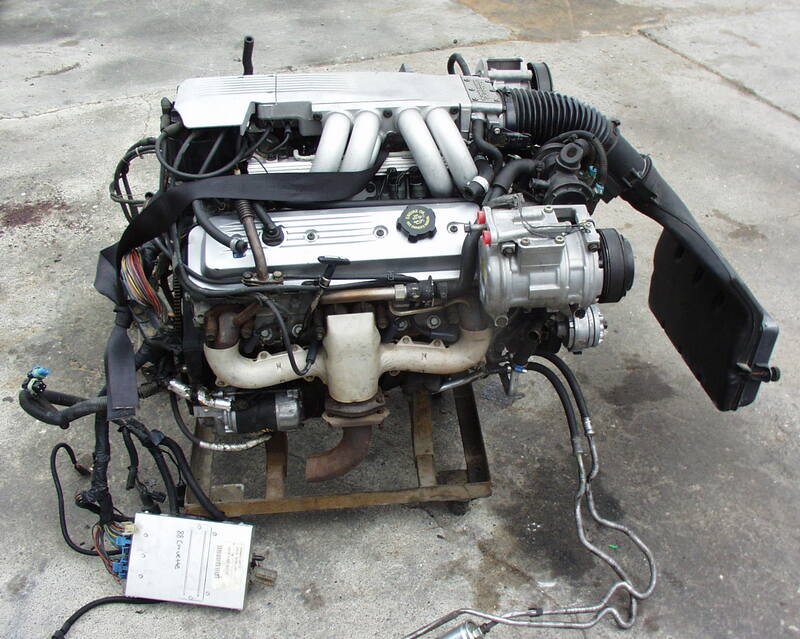 The Mazda four cylinder motor is very reliable and fairly easy to work on by a sports car owner. The Mt. Hood Miata Club is a local Miata club that hosts great special events and other benefits for Southwest Washington Miata owners like us. Last year we purchased 15-inch alloy wheels ofr Inky. We were going to paint or powder coat the used Miata Sport Editon wheels a candy lime green color (I will post a photo of them here when we get them installed on the roadster) but we decided to stick with the "Sparkle Silver" color for now. HOT RODS: We are "GM Collector Car" people. We have three car restoration projects. The 1936 Chevrolet 2-door sedan has been in Bonnie's family for decades. 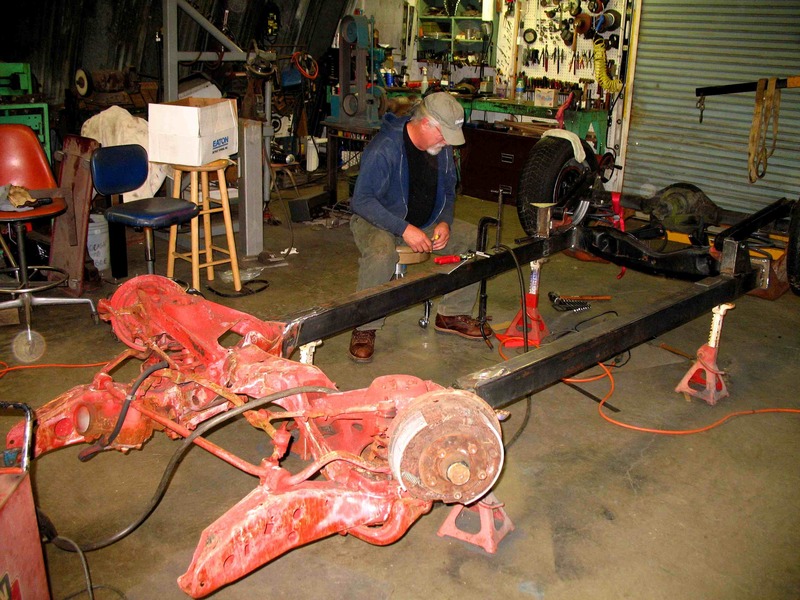 We have been restoring the body parts and provisioning a 1965 Chevelle frame to receive the '36 sedan body since 1997. The '36 chev will be powered by a 350 ci engine and automatic transmission for traveling across American on future road trips along old Route 66. The 350 Chev motor came out of a 1970's van owned by the family. We have been working on the '36 Chev project for over 15 years now. This winter we completed the modification of the Chevelle frame by adding straight side rails for mounting the '36 body. All of the frame suspension has been updated by Lee's Lineup in Chehalis, WA. We plan to mate the 350 V-8 block with a TH350 transmission on the frame sometime later this year. Mike painted the modified Chevelle frame in Zero-Rust black paint (see picture below.) The motor and transmission were mounted in the frame this summer. The modified frame is almost ready to have the body mounting brackets welded to the frame (see third picture below.) The turbo 350 automatic transmission mount has been welded to the frame. I did not plan for the clearance of the oak longeron frame sections along the bottom sides of the steel body. I used a Chicago Multitool from Harbor Frieight with Japanese style cutting blades for hardwood to cut the wood longerons back about to about 50% of their width so the '36 body would fit over the new frame rails. The new box rails are wider than the old flat-formed GM frame rails built in 1936. You can see the difference in frame rail shapes in the pictures below. We still have some cutting and panel forming to do to repair the rusted-out back seat floor pan in the body. After that we need to relocate the V8 engine mounts so there is enough room for the radiator clearance and fitting the '36 front fenders and hood to the Chevelle frame. Final body/powertrain/frame fits are always a challenge in these type of frame upgrade projects. The '36 Chev is now parked under cover at our home shop in Kelso. I need to start working on the '36 sedan again. Thank you Mike for all of your help! I am currently finishing the grill shell for the '36 sedan with metal etching and small pits filling. Our second restoration project, a Daytona yellow 1969 Camaro coupe, was purchased (without an engine) from a drag racing team couple at the Puyallup High Performance Corvette Swap Meet in 2003. The car was originally ordered as a "sleeper" in a stock Butternut Yellow exterior color with black vinyl bucket seats, metal factory air induction hood (RPO ZL2), spoilers (RPO D80), a four speed Muncey transmission, a high performance 12-bolt rear end, and the RPO LM1 350 V8 engine. The car was painted Daytona yellow by the second owners and configured for professional drag racing. We had the fuel cell and roll cage removed by a welder in Tacoma (he also repaired some nasty rust holes around the back rear window.) We removed the racing seat and carpets. In 2007 we bought new carpets and a new headliner. We are planning to re-install the original stock bucket seats and rear seat (that we also were fortunate to purchase through the third owners.) We found some OEM-spec replacement front fenders. A good friend (Joe, who owned his own body shop at one time) repaired the trunk and rest of the body metalwork. Joe installed a new floor pan and repaired the rusted-out rear inner wheel wells. Joe also helped me re-fit the new fenders and front end together. Bonnie and I found a completely-rebuilt GM Muncey 4-speed transmission, bell housing, and clutch & pressure plate combo with a new Hurst Camaro shifter package deal at the Canby swap meet in 2005. Camaro 350 Upgrade Engine: We found a good used 1988 L98 350ci/5.7L, Tuned Port Injection, small block V8 Corvette engine for the '69 Camaro in April, 2013. The "TPI" electronic fuel injection system was designed by Bosch for GM in the early 1980's, and the first TPI units were offered in Corvettes in 1984. We purchased the complete running engine in southern California at Troy's Auto Wrecking. Troy specializes in selling used Corvette cars and parts. The Corvette V8 we purchased is a "full pull-out" motor that includes everything but the transmission and a manual transmission flywheel (the donor 'vette was equipped with a 4-speed automatic transmission.) We will buy an aftermarket flywheel (McLeod or similar conversion unit from Summit Racing) to mate the Muncey 4-speed and a 10 1/2-inch clutch/pressure plate set with the 1988 Corvette L98 engine's crankshaft. The crankshaft's bolt pattern for the flywheel interface changed in the late 1980's from the standard pattern on prior GM small block V8 engines. The 1969 Camaro engine mounts will bolt right up to the 1988 Corvette's cast iron block (frame mounting changed for the LS1 engine design.) The Corvette L98 engine has aluminum heads and HEI distributor. The fuel-injected engines we saw at the Portland Swap Meet this year were either missing key parts or more diffcult to integrate into our Camaro than this L98 engine. I still need to move the '37 Chev coupe body out from under the garage car lift rack to work on the Camaro. A 1937 Chev business coupe is our third project car. We have all of the parts to build a Pro-street style, '37 Chev 5-window coupe "Gasser" that can be driven on the street. I want it to look like the street racer coupes of the early 1960's that used the original straight beam front axle and often ran with "cheater" slicks (race tires with minimal hand-grooved tread features to make them street use legal.) This will be the last project car to be completed. Rare Parts in California modified the steering arms for replaceable ball joints and sold us new tie rod parts for completing the OEM straight front axle assembly. The staright axle is now equipped with late-model GM front disk brakes. I will mount the parts soon on the front axle so it can be installed on the stock '37 Chev frame. When the frame has both axles installed the coupe body can be moved around to complete the Corvette engine installation in the Camaro. Eventually I planned on fitting the coupe's frame with old-fashioned traction bars and an 8-inch Ford Mustang rear end (removed from a late 1960's Mercury muscle car.) I purchased new traction bars at last year's (2017) Portland Swap Meet. The body interior will be outfitted with two Recaro bucket seats mounted in a plain, all-black naugahide business coupe interior. If I keep this project car, I would like to equip it with a vintage 327ci Hi-Performance Chevy V8, collector box headers, and the B&M hydro-stick automatic racing transmission out of the '69 Camaro. I had planned on painting this car one of my favorite candy pearl colors, Chrysler "Viper blue". Most of the body will remain stock-looking with OEM door handles and stainless steel trim that came on the Deluxe business coupes. The goal is to create a nostalgic, "grudge drag racing" syle street rod, without a lot of custom billet "bling-bling" and expensive rodding frills.